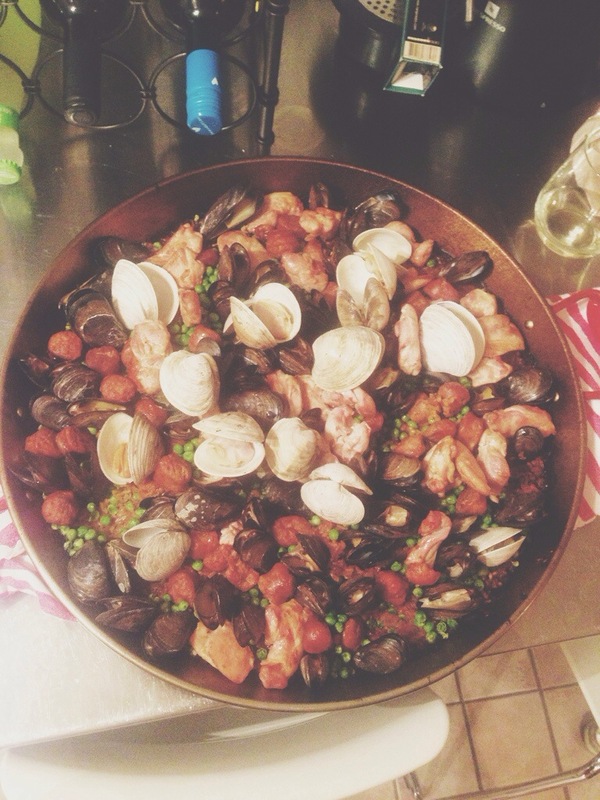 I need to document how I made this paella since it was a blend of a ton of recipes. I knew I wanted to make it on the grill and I wanted to use mussels, clams, chorizo, chicken. 1. Heat up paella pan on grill over high heat. Pour a little bit of olive oil and cook chorizo (about 8 mins). Remove from pan and put aside. 2. Cook chicken thighs until lightly browned on both sides (about 6 mins). Remove from pan and put aside with chorizo. 3. Add a little bit of olive oil. Cook onions until translucent (about 6 mins). 4. Add garlic, paprika and saffron and mix until fragrant about 30 seconds. 5. Add tomatoes and mix until you have a thick compote like mixture about 12 mins. 6. Add rice and mix with tomato compote. Spread out rice in thin layer so most pieces of rice are toasted, about 4 mins. 7. Add wine and stir until absorbed. 8. Add broth. Close grill and do not stir (or disturb at all) for 20 mins. 9. If rice is ready, add reserved chicken and chorizo. Sprinkle peas over rice. Add mussels and clams hinge side down and close grill. Cook until shellfish opens about 12 mins. 10. Remove from grill and cover. Let stand for 5 mins. Remove any mussels or clams that haven’t opened. Serve immediately! Something to keep in mind, clams take longer to cook. I ended up removing them when I took the paella off the grill and cooking them on the grill for an extra 4 mins until they opened. Also, make sure you have everything prepped when you start cooking. I served it with gazpacho, tortilla, and a white asparagus, leek, bacon and pine nut salad. I am IN LOVE with my paella pan. It actually didn’t fit completely on my grill (grill wouldn’t close completely) so when I added the broth, I covered the open grill spots with aluminum foil. It was pretty windy but I don’t think I would have needed to cover it if it wasn’t. Maybe next time I’ll make this in the oven but probably not.